Lisa D. Writes: More FREE BOOKS!!! Thanks to everyone who entered last week for signed copies of Sharks & Boys by Kristen Tracy and Original Sin. But, guess what? I've got more signed books for you! Who wants a signed copy of Cassie Clare's City of Glass? Anyone? Excellent, because I have one for you! And, because I love you, I'll throw in a signed copy of Original Sin again. =) All you have to do to enter is comment below by Friday, 10/14 at noon PDT. If you Tweet or Facebook a link to this contest that's a second entry. And...I have a surprise for you! Remember last month when all y'all won first chapter and query critiques cuz I was celebrating my two year signing anniversary with my truly fabulous agent, the one and only Suzie Townsend? Well, the celebration continues! Tomorrow, and extra special contest will go up right here on the blog involving the fabulous Suzie and a first chapter or query critique! Don't forget to stop back in and check it out! But, wait! There's more! Cuz you still have time to enter my (and several other) contests for a Last Rite galley and an iPod shuffle preloaded with the entire playlist for the trilogy! I <3 you!! I cannot wait to get my hands on Last Rite, and I sooo need signed MI and OS books whooot!!!! Very cool! Thanks for the contests! Ohh that sounds exciting!I love TMI! Love this contest. Both great books. Original Sin and City of Glass?! Thankyouthankyou! Books! That I Love! Thank you! Is this for Canadian residents? I hope it is, if it isn't, well too bad for me:( the contests are awesome, BTW:). AHHH! I LOVE you Lisa (just got into The Mortal Instruments Series, too, on the same vacation where I got hooked on your books.) Can't wait for tommorrow's contest! I'm just crazy for the Mortal Instruments serie!! !And with a signed Original Sin too? !What more on earth could I want?!? !Thank you so much for the giveaway!!! OMG how much awesomeness can there BE on your blog?!?! you have the coolest giveaways :D thank u! Double WOW...enter me please. Would love to win them. i love these contests!! i check twice a day!!! you are the best! Hey girl! Im entering for my friend Cherie, mondofan of cassie clare! Do you realise that your blog attracts me like a moth to a fly? And do you realise how much you amaze me with your awesomeness? Oooo sounds so fun and cool!!! oooh me me!! !I'm so entering this! I would love to win these! You are amazing! Would love a copy of Original Sin! And a signed copy of CoG wouldn't be bad either. thanks for the opporitunity. woow thank you for this giveaway. i hope i win a copy of Original Sin. Wow!!!! Would love to win these ! !Thanks for this give-away !you are awesome ! great giveaway! thx so much!! I would love to win! You have such AWESOME contest! The love TMI! I also tweeted the link! Wow, thanks for this amazing giveaway!!! Great contest. would love this book. I loved the first one of this series and would love to add this. I love both of these books there so amazing! Folllow you and tweeted and FB shared it! Love this contest! Would be so awesome to win! I would love to get City of Glass so please enter me if the giveaway is open worldwide. 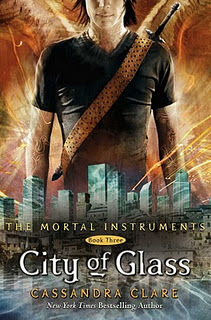 I cannot wait to read City of Glass! ooh, sounds great, please include me ! Thanks so much for all these amazing contests that you're hosting! Thank you for offering such wonderful giveaways! Being a published author myself, I love collecting signed copies from other authors! I posted this on Facebook: Enter by 10/14 to win 3 books! Can't get better than free! Personal Demons: More FREE BOOKS!!! and posted the same on Twitter. OMG!!!! This is incredibly generous of you!!! I am a HUGE fan of Cassie Clare! LOVE her books!! You're awesome!!! Thank you so much for the chance!! OMG! I just finished reading Personal Demons and I can't wait to read Original Sin! =D I'm a huge fan of the Mortal Instruments as well, so this is just the most amazing giveaway EVER! XD Thanks for the chance!!! How did I miss this one the other day? Pick me, pick me! Thank you! I'd love to win these books! Thanks!